*Content Management Platform based on Web, easy to use, drag&drop. *Supports: SMIL, HTML5, Media RSS. Flexible programmation: Playlists embedded in other playlists. *Sinchronization and Remote Screens Control instantaneously. *Multiformat: Videos, images, web pages, audio & video streaming, Media RSS, TV overlay, PiP, RSS Ticker, Playlists..etc. Affordable solution with the minimum investment..
*Compatible with most of the SMIL* Players in the market. 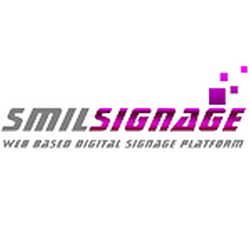 Synchronized Multimedia Integration Language (SMIL) enables simple authoring of interactive audiovisual presentations. SMIL is typically used for "rich media"/multimedia presentations which integrate streaming audio and video with images, text or any other media type. SMIL is an easy-to-learn HTML-like language, and many SMIL presentations are written using a simple text-editor. 	Different Access Levels for Users and Administrators 	Affordable solution with the minimum investment.. 	Compatible with most of the SMIL* Players in the market. www.a-smil.org Synchronized Multimedia Integration Language (SMIL) enables simple authoring of interactive audiovisual presentations. SMIL is typically used for "rich media"/multimedia presentations which integrate streaming audio and video with images, text or any other media type. SMIL is an easy-to-learn HTML-like language, and many SMIL presentations are written using a simple text-editor.